New. Creates a new Tinderbox document file. The new file's document preferences will be based on Tinderbox's stored defaults. New Window. Opens an additional window for the current document. Open… Opens an existing Tinderbox document file. A file open dialog is shown so that you can locate the file. The default folder offered will be the last-used folder. Open Recent. A sub-menu listing recently used Tinderbox files. The list holds up to a (default) 7 filenames; the maximum list size can be changed via the config.xml file. Open Favorites. A sub-menu listing Tinderbox files stored in Tinderbox's application support's 'favorites' folder. Close Window. Closes the current Tinderbox document window. Closing the last window in the file (or current file if more files are open) will prompt a save before closing dialog. Hold Shift key to see alternate menu item: Close File "filename". Where "filename" is the name of the current open TBX documents, or the name of the TBX file owning the current window if more than one file is open. Clicking closes that file. There is no confirmation - any outstanding changes are saved automatically. Hold Option key to see alternate menu item: Close All. Close all TBX documents currently open. Save. Invokes the file save routine (current filename and location) for the file, or current file if more than one. The default folder offered will be the last-used folder. Duplicate. Duplicates the existing file in situ, using the existing filename with ' coy' appended to the name, and then opens it in Tinderbox in front of the source document window. Hold Option key to see alternate menu item: Save As… Opens a file save dialog to allow selection of the save location and/or new file name. The default folder offered will be the last-used folder. Revert to. A sub-menu offering previous version to which to revert the current document. Update Agents Automatically. On/off toggle. If 'on' a tick is shown in the menu left margin for this item. When 'on' Tinderbox automatically runs agents on a regular cycle. Note there is no Preference or Attribute to control this setting, though this equates to a doc-level preference. When 'off' ($AgentPriority is 0), the Agents and Rules Inspector indicates agents are on manual update only. an agent appears not to function and you wish to be sure it has run its code. there are chains of interacting agents. In this case it may require invoking several updates to pass data along the chain. 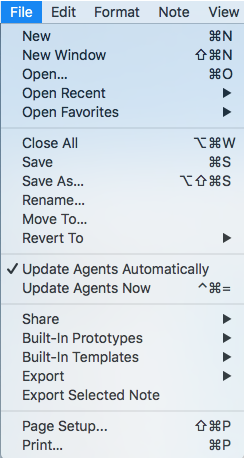 some agents are on low priority and thus done fire every update cycle. you need an on-demand single cycle of agents when automatic updates are off. Note though, that if you have agents interrogating other agents one agent cycle may not refresh all agents to the degree assumed. Share… (v6.4.0+) Opens a sub-menu of Sharing options. If some note(s) are selected, those notes will be shared with compatible programs. If no notes are selected, the Tinderbox document itself will be shared. The options listed in the sub-menu will depend on the range of apps/services installed on the Mac's current user account. Built-In Prototypes. Opens a sub-menu listing a choice of built-in prototypes that can be added to the current document. Built-in Templates. Opens a sub-menu listing a choice of built-in (export) templates that can be added to the current document. Export. Opens the Export sub-menu. Export Selected Note. Opens a dialog for exporting individual notes. Page Setup… Calls the OS page setup dialog. Print… Invokes OS printing dialogs.